and must be shared before it is lost in the annals of time. A number of weeks ago, my friend, Chief Bruce Kline, called to give me a tip to a story he felt was worth researching. 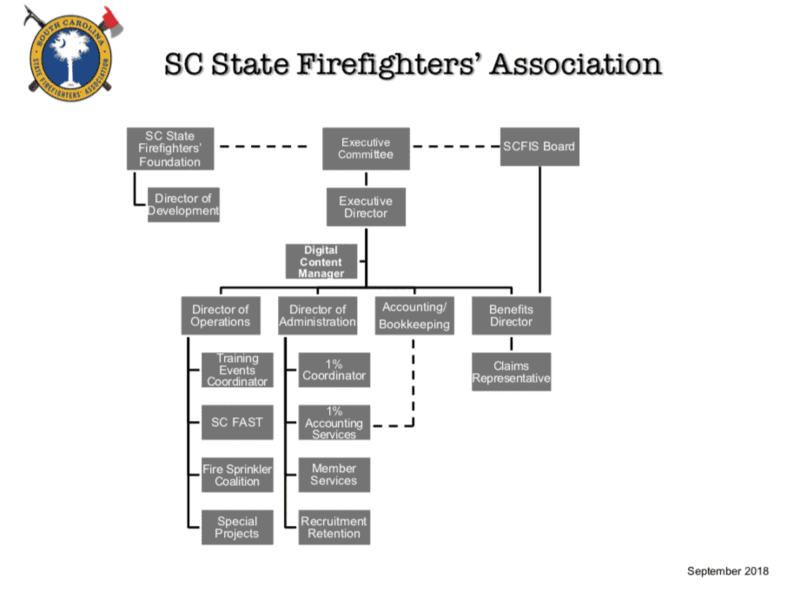 He prefaced his remarks by asking the question, “Who is/was the oldest, active firefighter in South Carolina?” As I rummaged my feeble memory, I threw out a number of names of people who have served for 50 or even 60 years, but that’s where I stopped. It was then Chief Kline revealed the brief story of Herbert Tanner of Hemingway who served his department actively for 72 years before health and age finally claimed the life of the old fireman. W. Herbert Tanner was born on November 11, 1919, in Johnsonville, to Robert and Reck Tanner. Raised in a farming area bordered by Florence and Williamsburg Counties, Herbert was one of eight children who, according to his son, Ronny, “came up hard in a family of farmers who needed kids to help on the farm.” And so Mr. Herbert’s childhood and teen years were shaped by the traditions of hard work, simple pleasures, Christian discipline, and a foundation of character based on honesty and integrity. Mr. Herbert only went through the 10th grade in school, and in 1936, at the age of 17, joined the Army and was later sent overseas to fight in World War II as part of a reconnaissance group. What we know about Mr. Herbert’s experiences during those war years is limited at best, other than a few rare mentions of the hardships shared later in life with family members. Son, Ronny, indicated that his father saw significant action during the War; he fought at Normandy on the second day of fighting after the D-Day Landing; he was wounded twice and injured when his jeep rode over a mine; and he experienced long hours in foxholes where he could hear the footsteps of the enemy nearby and conveyed the horrors of his buddies falling around him. He even told family members about the time a donkey fell on top of him while in the heat of a campaign. Because of Mr. Herbert’s valor, courage, and wounds, he was awarded the Purple Heart. While on a furlough to his home town of Hemingway in 1939, Mr. Herbert joined the volunteer fire department on June 5th, under the direction of Chief F. E. Huggins. Even with military duty, Mr. Herbert managed to answer calls every time he came home on leave and was considered a permanent member of that department because his chief knew one day soon Herbert would come home for good to serve out his life as a fireman. When Mr. Herbert returned to his beloved hometown from the War, sometime around 1945, Fire Chief Huggins welcomed him back as one of the most dependable and efficient members of that department. In the mid-1950s, Chief Huggins retired and turned the reigns of leadership over to Mr. Herbert, who by now had become very proficient in the skills of firefighting by availing himself to every training class offered to firemen of that day. Ronny Tanner, the only child of Herbert and Ruth Tanner, recalls with clear memory and enthusiasm the eerie wail of the town’s siren situated on top of the water tank located near the fire station. On many occasions as a child, Ronny reflects on his mother’s invitation to go with his dad to pick up the fire engine and respond with him to an alarm of fire. As a youngster and teenager, Ronny loved every opportunity to accompany his father to the station; it was fun for him to run and jump on the back of the old engine as his dad drove out the building. Mr. Herbert worked for many years as Sales Manager for the local Chevrolet dealership and had a clear understanding with its owners that when there was a fire, he had an obligation to drop what he was doing in order to attend to the fire. While the town had a couple of dozen volunteers back then, none could beat Mr. Herbert to the station to drive the engine. He was always the first to arrive at the station to throw open the doors and proceed to the alarm with siren blaring and lights flashing. At age 80, Chief Tanner was responsible for encouraging the mayor and town council to purchase a new engine for the fire department. The new apparatus was built in Pennsylvania and had to be driven to its new home in Hemingway. So, the Chief and several other firemen went for the final inspection and probably argued over who would drive the new engine home. Of course, Chief Tanner won the debate and drove the engine all night to its journey’s end in Hemingway. Chief Tanner continued on as Hemingway’s fire chief until 2002 when, at age 83, Mr. Herbert finally convinced George Sutton, the High School coach, to take over the fire department’s operation. However, just because Mr. Herbert was stepping down as Fire Chief, it did not mean he was also stepping down as a volunteer fireman. On the contrary, Mr. Herbert continued to beat his fellow volunteers to the fire station on nearly every alarm to drive the apparatus to its needed location. During a recent interview with the current Hemingway Fire Chief, George Sutton, many tales on Mr. Herbert were shared with me that brought laughter and almost tears at several times during the discussion. One story involved the running feud with Mr. Herbert and the Police Chief. It seems that Mr. Herbert always parked his pickup truck conspicuously in front of the fire station in a location that was marked in yellow as a “No Parking” area. The Police Chief frequently picked at Mr. Herbert for his disregard of the law, and on one occasion even wrote the ole Chief a parking ticket. Not to be outdone, Mr. Herbert paid for a sign to be affixed to the fire station which settled the dispute once and for all. The sign reads, “DON’T EVEN THINK OF PARKING HERE”, and remains until this day as evidence of just who won the feud. “alleged” use of the town’s fire truck for purposes other than town business. It seems that Mr. Herbert always had a garden from which he delighted in sharing his harvest with neighbors, friends, the elderly and shut-ins. During those lean times of no rain, Mr. Herbert is “reported” to have driven one of the town’s fire engines to his garden to nourish the growing vegetable plants with water from the truck’s booster tank. If the story has any truth to it, most likely Mr. Herbert could justify the use of the fire engine on personal property as part of a training exercise or preventive maintenance program. Needless to say, the town’s administration never mentioned a word about the street talk! Toward the end of our conversation, Chief Sutton shared the most difficult story of all…the time when Mr. Herbert had to be told he could no longer drive the apparatus. It seems when Mr. Herbert turned 90 years old, he was still beating the other volunteers to the fire station to drive the apparatus. According to Mr. Herbert’s son, Chief Sutton called him one day to seek his advice on how to handle the sensitive subject of stopping the former Chief from driving to fires. “I don’t know what to do with your dad,” Sutton said to Ronny. “We want to honor him, but he simply can’t drive the truck anymore…you gotta do something,” Chief Sutton reluctantly vented to Ronny. Well, that day came sometime in 2011 or 2012 when Mr. Herbert approached the age of 93. Although it was a difficult and awkward duty, Mr. Herbert accepted the fact that the time had come to step aside and let the younger guys take the responsibility that he felt was his to assume. Longtime Hemingway Attorney, Jerome “Romie” Askins, called Mr. Herbert “my friend” and said, “when Mr. Herbert died, a big piece of Hemingway was lost.” While talking with Attorney Askins, story after story surfaced about his friend and mentor. When Romie was a Cub Scout around 8 years old, his den went to the fire department where Chief Tanner awaited them. After sharing a lecture on fire safety, the ole Chief surprised the scouts to a ride around town on the fire engine. Askins admitted that in those days, folks weren’t too concerned about law suits. Attorney Askins also shared the story about the time Mr. Herbert, then well into his 80s, visited the Askins’ pond house one day while Romie was laying shingles on the roof. Mr. Herbert asked Romie could he help, and the young attorney jokingly told him no, unless he could bring him a couple of bundles of shingles up the ladder. As Romie nailed his few remaining shingles on the roof, he heard a noise and looked around to see Mr. Herbert climbing the ladder carrying the first of several heavy bundles of shingles…a strenuous task for even the fittest of young men! According to Ronny Tanner, Mr. Herbert’s and Miss Ruth’s only child, “the reason my dad stayed so active for so long was he didn’t know he was supposed to slow down. He was always working…couldn’t stay still, always had to be doing something, usually for someone else. He never lost his purpose or drive.” For his long years of service, the Town of Hemingway rightfully honored Chief Herbert Tanner by dedicating the fire station the “W. Herbert Tanner Building” in September 2009. In April 2013, Ronny moved Mr. Herbert to an assisted living facility in Beaufort so he could be close to his family. Even in a new and strange environment, Mr. Herbert found things to do. The management at his new home put him in charge of supervising fire drills for the elderly residents where he took particular care in their safe evacuations, making sure fire doors were closed, and the staff were thorough in doing their jobs. W. Herbert Tanner died on Tuesday, July 12, 2016 at the Beaufort hospital at the age of 96. “listen to an old firefighter, for when they die a library has been lost” (author unknown).